Papa have been coughing a lot. 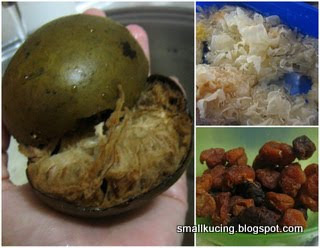 Thus Mamarazzi decided to make Sea-coconut with Lo Han Guo Leong Shui the other day. And of course must have SEA COCONUT. 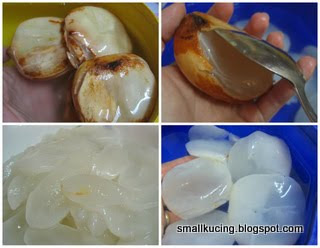 Auntie Cleff, this is how Sea Coconut looks like before made into Leong Shui. Last time Mamarazzi was "jakun". Doesn't know how to take the skin off the sea coconut. She went and use knife to peel like people peeling apple. Then complain pulak it's very difficult. Adoi!..that was when the seller laughed at her. Told her to use a spoon and scoop out the pulp. 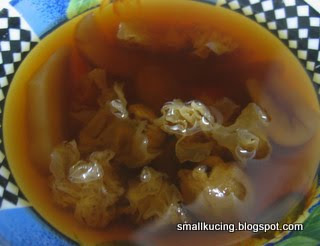 well after scooping out the pulp, then just slice into thin slices. Throw everything into the pot and boil. Oh ya...put a bit of Rock Sugar to taste. Wek! Tarak sedap.I don't like the taste of the Lo Han Guo. Papa pulak very clever. Cabut lari to work. Haiz...Mamarazzi drink la. oh... you give to mummy ling also nvr give me.. don't want to friend you liao.. :p nvm, I cook myself at home... weekend coming, any plan bo? Cough, cough, cough, Ahem....I also want leh! Wei..you cook much nicer than mine la. Paiseh lor if give you. No plans yet this weekend. Why ah? Joshua, i can shake hands with u on this.. i dont like the loh hon kuo taste too.. just give me the sea coconut with mutt choe enough.. haahaha..
eh, kathy, i also find it troublesome to skin it, nasib baik u said scoop up with spoon.. hope it jadi for me..
LOL looks like I am not the only one who is blur how to skin the Sea coconut lor :p yay..
Never seen that before except in tins and canned drinks...and sea coconut cough syrup! LOL!!! mamamamarazzi....i am coughing...and WILL BE coughing when i see you next! you sek do ok! I think Gwen also tak suka. But I like lor. :D Those ingredients don't know where to find lah here..haha. 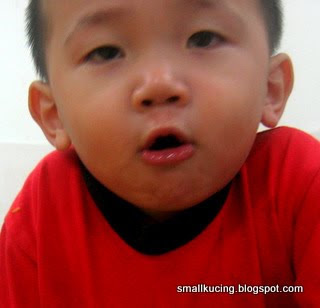 Hehe... your facial expression so cute, so blur. next time do like papa, run! This J... looks like want to muntah liddat. LOL At Joshua! Pass to me lar.. I'm very heaty these days! LOL! Ai yo, nobody drink yeah? Give me and my family. We love it so much! For me, I will freeze the sea coconut and just when I wish to cook it, I peel it under the tap water. The skin can easily fall off too. The Seacoconut can freeze one ah? I didnt know. Thanks for the tips. I am going to save the drops I got from NuNaturals and see if it works for coughs.